Over the last two years Fire Mountain neighbor Jay has kept up the blog called Fire Mountain Garden Exchange. We have lots of great archives for you, but felt like our gardens are part of our lifestyle here in Fire Mountain and so decided to migrate some of the information to this site. Mainly – the recommendations from Charles Ledgerwood’s “Reliable Seeds 1994”. We have all tried many recommendations and I know I have found that these always turn out the best. For a bit more on Mr. Ledgerwood visit the first post from FMGX archives. So without further adieu, welcome to the monthly recommendations of Mr. Charles Ledgerwood. Caps indicate best plantings for the month. BEANS, BEETS, CARROTS, CANTALOUPE, CORN, CUCUMBERS, EGGPLANT, LIMAS, OKRA, parsley, PEPPERS, PUMPKIN, RADISH, N.Z. SPINACH, SQUASH, SUNFLOWER, TOMATOES, JICAMA, WATERMELEON & SWIS CHARD. Alyssum, Ageratum, Asters, Asparagus fern, Balsam, Basil, Bells of Ireland, Candytuft, Carnation, Celosia, Centaurea, Cobaea, Convolvulus, Calliopsis, Cynoglosum, Cosmos, Dahlia, Daisies, Delphiniums, Dianthus, Didiscus, Dimorphotheca, Dusty Miller, Fountain Grass, Gazania, Gloriosa Daisy, Geranium, Gourds, Gypsophilia, Helichrysum, Impatiens, Ipomoea, Larkspur, Lavender, Marigold, Nasturtium, Passiflora, Phlox, Petunia, Platycondon, Portucula, Rudbeckia, Salvia, Salpaglossis, Scabiosa, Statica, Sweet Sultan, Tithonia, Thumbergia, Torenia, Sunflower and Zinnia. Remember this list is from 1994, please check Sunset Western Gardens for more information on plant names and more importantly for drought tolerance. 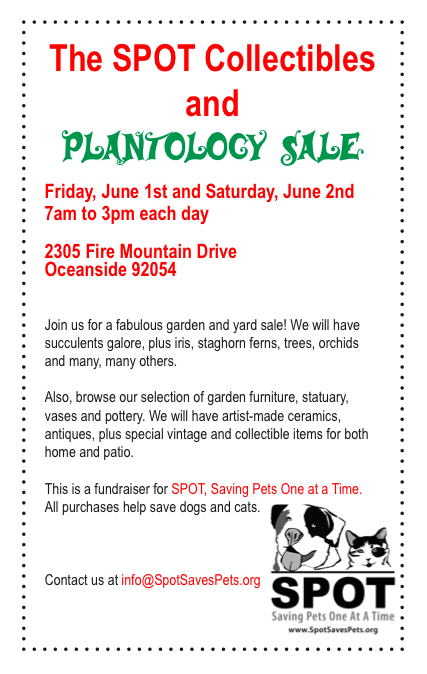 Join us for this fabulous garden and yard sale! 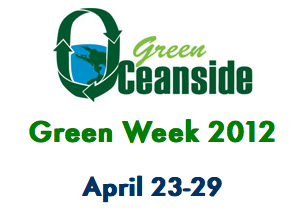 Check out a week of fun, informative, FREE events during the City of Oceanside Green Week, April 23-29, 2012. A few of the events include a film festival, compost workshops, a FREE used oil filter exchange, FREE e-waste drop off, and the Loma Alta Creek and Beach Cleanup.